Last Saturday, I went home from the apartment. It was a long way home and my car’s tires were bad so, we have to change it. Long way home and I’m hungry. Bad stomach after minutes driving. I feel sick. I got home at 2 P.M. and I saw SKY and HERO healthy as always. 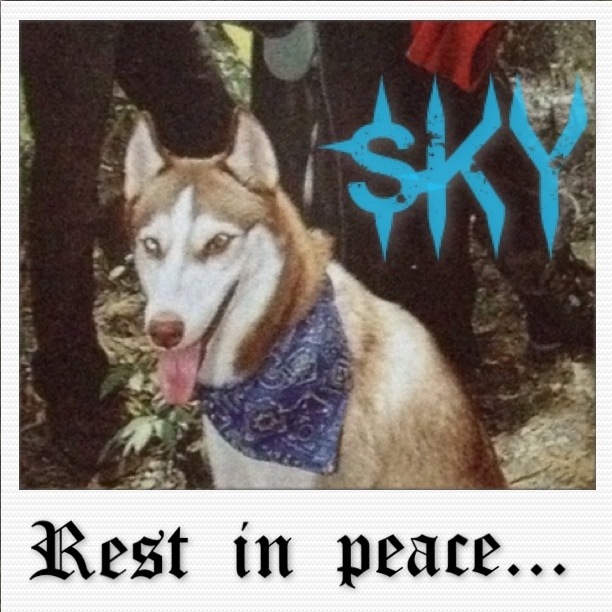 SKY just gave birth on September 8th. 5 puppies but, we lost one due to the small size and malnutrition. But, it’s a happy family. Around 4 P.M. SKY didn’t look so good. I went out to take a look. She feel on the ground while trying to greet me. We called the doctor. So many bugs. Flees. They’re sucking the blood outta her. This was caused by the wild dogs outside the house. They brought only virus, flees, and bad stuff! Curse you! Around 6 P.M. Doctor, we called, that’s the vet. He gave SKY an injection. He said she’ll be fine. I went somewhere with my grandma and my mom. I prayed so that God won’t take her away from me. The next morning… SKY died. I can’t think of anything. I kicked everyone outta my room. I cried. I spent my day crying and feeling so emotional. I was so angry. At myself. As I couldn’t take good care of her, she died and it’s on me. Even when I write this, I can’t hold my tears from falling. First time I met SKY was in PTC. I remember that time, I look at her. She’s so small yet beautiful. I fell for her. I can’t help but to beg my parents so I can have her. I got her. There’s no way my parents would let het sit on the car seat. So I took my jacket off and hold her. It’s a long way home. 1 hour and 20 minutes. I hold her in my arms. She was there on my lap. All the way home. We introduce her to Shiro. My miniature pinscher who died years ago. They’re good with each other. After Shiro died, SKY is a bit lonely so I took HERO in from a friend. Cost a lot but, he will be a good companion to SKY. I remember when I have a photo session at senior high school for farewell. I brought SKY with me. She was so happy, running around. We should have gone to more places. I’m sorry, SKY… If only we had more time together.